Turkish Politics in Action: Ahead of the Curve? Also included in the litany are Gunay's efforts to publish the work of Kurdish poet Ahmed-i Hani, funding for a film featuring Kurdish language, "İki Dil Bir Bavul," and religious ceremonies at churches that have in some cases not had ceremonies in 100 plus years. Gunay said periodic services could be had at former Christian sites with the permssion of the governor ofthe province where the site is located. I am not sure how this fits into the Culture of Ministry's domain, or what the details are (or, if it amounts to much more than political showmanship), but would hope to learn more. 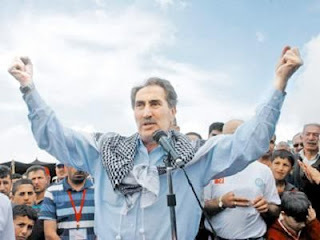 In June, Gunay addressed Kurds in Hakarri, putting himself at the front of the government's recent Kurdish intiative, declaring then DTP leader Ahmet Turk, now facing criminal charges and a ban from politics, to be the most important person for peace in Turkey.